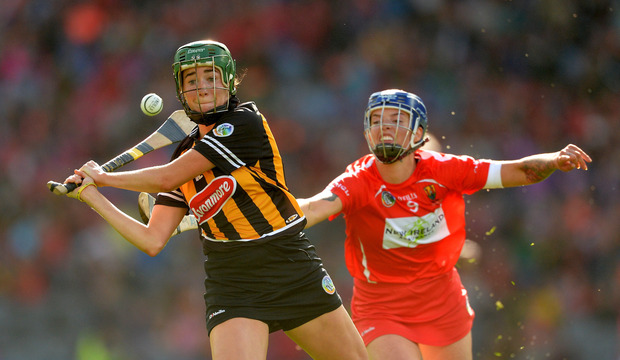 Denise Gaule of Kilkenny in action against Ashling Thompson of Cork during the 2017 Liberty Insurance All-Ireland Senior Camogie Camogie Final match between Cork and Kilkenny at Croke Park in Dublin. All-Ireland camogie finalists Cork and Kilkenny have named their sides ahead of this year's final in Croke Park on Sunday. Defending champions Cork will be looking for a repeat of 12 months ago where they beat Kilkenny by a single point in a dramatic final, with former captain Julia White scoring the winning point in injury time. Kilkenny made it to the final with a narrow three-point victory over Galway in Thurles last month, while Cork strolled past the challenge of Tipperary, a second-half surge from the Rebels proving enough to see off the Premier by a margin of 12-points. Cork will be skippered from goal by Aoife Murray who will be going for a remarkable ninth All-Ireland crown, while last year's hero Julia White earns a starting place in midfield having come off the bench in 2017. Kilkenny. who last won the title in 2016, will be skippered by Shelly Farrell of Thomastown, with top scorer from the semi-final Denise Gaule one to watch at left half-forward. The 2018 All-Ireland camogie final will take place in Croke Park on Sunday, throw-in at 4.15pm.